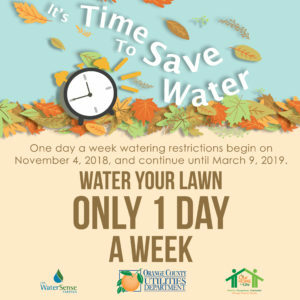 Orange County, Fla. – When clocks change by one hour on November 4, 2018, Orange County residents should also remember to change irrigation timers to one day per week. This schedule will remain in effect until Daylight Saving Time returns March 9, 2019. The time change corresponds with mandatory lawn and landscape irrigation restrictions that specify the watering days based an odd- or even-numbered addresses. Water only if necessary and not between 10 a.m. and 4 p.m. Restrictions apply to private wells and pumps, ground or surface water and water from public and private utilities. For more information, please go to occonservewater.net, call 407-254-9850 (select option 1, then option 2) or email Water.Division@ocfl.net.